Free large car park, air conditioned, fully licensed bar, large dance floor. A typical evening is arranged into two dance lessons with free style dancing in between. 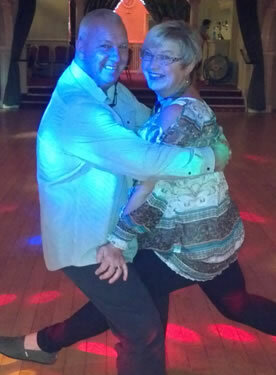 The first lesson of the evening is aimed at beginners and those who have been doing French Jive for six weeks or less. For those people who are more confident or who have been dancing longer, a second more difficult class is taught later on. We have a rota of teachers at this venue. On the first Wednesday of each month, Keith Davies is our instructor. On the second and third Wednesday, it's Phil & Wendy. And on the 4th Wednesday, it' Just Jive's very own Sue. The venue is very well established and is often nearly full to capacity. The people you will meet are a very friendly bunch and come from all over the region. There are experienced dance crew on duty each night who will make sure your dancing progresses. They all wear distinctive tops, and are easy to spot. If you are a beginner, ask them for a dance. For those who are keen to give their dancing a jump start we hold regular dance workshops at this and other venues. If you're not sure how to find us, this map should help.